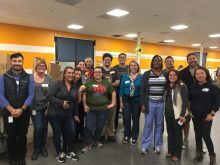 Our Campbell and San Jose teams recently wrapped up the Second Harvest 2016 48-Hour Virtual Race to End Hunger. The event took place November 15 – 17, and raised a total of $683,250.19 for Second Harvest Food Bank (SHFB). That's going to pay for over 1.3 million meals to be distributed through the 850+ meal sites that SHFB supplies. Second Harvest Food Bank is based in Silicon Valley and is one of the largest food banks in the nation. It was founded in 1974 and currently partners with a network of more than 320 nonprofit partners. SHFB seeks to increase access to food resources and to supply an additional 100,000 hungry people each month. The food bank already serves more than a quarter of a million people each month. 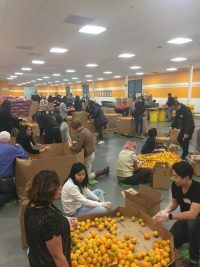 In fiscal year 2016 (July 2015 – June 2016), we distributed more than one million pounds of nutritious food each week to low-income people in need in every zip code of our service area from South San Francisco to Gilroy, and from the ocean to the bay. To make all of this magic happen, SHFB depends on donations and volunteers from around the region. Barracuda volunteers sorted 26,000 pounds of cans, apples, mandarins, and oranges. Our teams also raised $38,217, which pays for over 76, 434 meals. We placed 3rd place behind Cypress Semiconductor and Fenwick & West LLP in the Per Capita category. 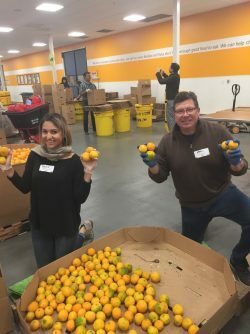 The others in the top eight were Cisco, Maxim Integrated, KLA Tencor, Veritas Technologies, and Rambus Inc.
Second Harvest Food Bank has been a part of CudaLife since 2012. Our CEO BJ Jenkins is one of the past Chairs of the charity. If you would like to volunteer or donate to Second Harvest Food Bank, you can get more information on their website here. If you'd like to contribute to the 2016 Holiday Food and Fund Drive, visit this link.